“Hello, little China Doll. It’s me again. 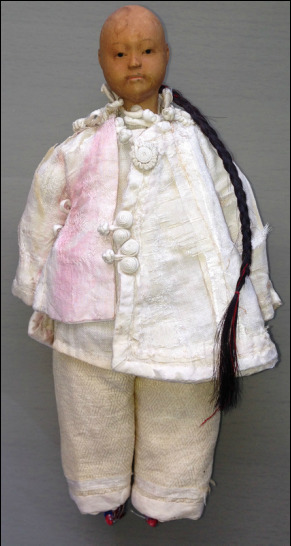 Here, let me fix your clothes.” China Doll wears a hand-sewn suit of faded pink and yellow silk. He was created out of tenderness and love and has been shown only that. With his long black braid and wise wooden face, he seems to whisper of long-ago days, of covered wagons and frocked little girls playing in the open prairie with the wise China Doll watching benevolently from a safe and carefully chosen spot. Whispers of grandmothers and mothers; of heritage and history; of cellars; of smiling mothers’ faces as they looked through old things and came across my fine old China Doll. ​I see China Doll’s face, so wise, so old, and lay it on my shoulder, tenderly touching his faded pink shirt and quietly, tears begin to form. I see China Doll’s face again and let my tears fall. Silently, I grieve for my lost childhood.